Irruptions of birds from the continent often occur because of bad weather or shortage of food. 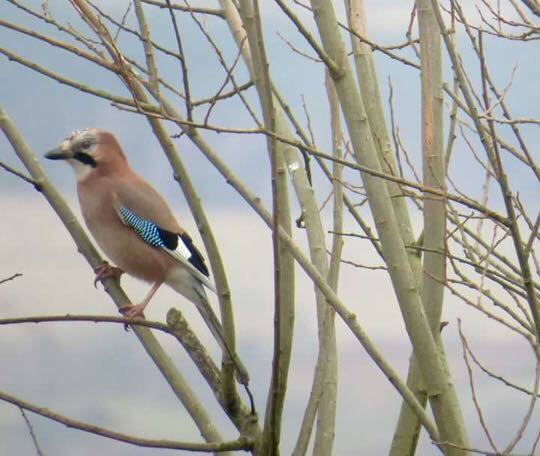 As this autumn was particularly mild over western europe, it is thought that the extra numbers of Jays have possibly been due to the shortage of acorns. Jays are normally fairly common further inland e,g, around Loch Awe, but uncommon along the coast. Whether they are Scottish birds or from the continent, they could stay until their breeding season kicks in which is late April, early May. For whatever reason enjoy these beautiful birds and their raucous calls, for they will eventually return east in the spring. Pine Martens have also been recorded throughout Lorn from Ballachulish in the north to Lochgilphead in the south. An individual here on Seil has been seen from Balvicar down to Ellenabeich hunting both magpies and chickens. Another recorded at Kilmore visits a members garage for food and shelter. They will readily come if food is provided and are often advertised to attract visitors to stay. With the help of the BTO (British Trust for Ornithology) we have set up a LNHG user group on Bird Track (http://www.bto.org/volunteery-surveys/birdtrack) for anyone to record their own bird records e.g. Jays. Please let LNHG know if you wish to participate in this worthwhile project, access can be provided.